Please note that the bus may stop at Kangar bus terminal and Shahab Perdana to pick and drop passenger. Bus from Kuala Perlis to KL does not just serve locals Malaysian, but also serves thousands tourist going back to KL after their wonderful Langkawi Island trip. Kuala Perlis Jetty is the port for the ferry coming from Kuah on Langkawi Island. Kuala Perlis jetty is just 5 minutes walking distance away from Kuala Perlis bus terminal, where you can catch express bus to Kuala Lumpur and Butterworth. Duration for bus from Kuala Perlis to KL usually takes about 6-7 hours, depending on traffic condition. All coaches departing from Kuala Perlis bus station will also go to Kangar bus terminal next to KWSP building before continuing the journey to KL. Hence, passengers should not be surprised that the bus does not go directly from Kuala Perlis to KL. Bus from KL to Kuala Perlis usually will provide 1 washroom break along the highway. The bus fare for standard VIP bus from Kuala Perlis to KL is ranging from RM 35.00 to RM 55.00, depending on the bus company. Etika Express, Transnasional, Plusliner and Sri Maju Express are few popular choices for passengers taking bus from Kuala Perlis to KL. These coaches are installed with features like air conditioning and reclining seats to provide passengers with a comfortable journey from Kuala Perlis to KL. Because of shortest ferry ride and cheapest fare from Kuah on Langkawi Island to Kuala Perlis Jetty, ferry service from Langawi Island to Kuala Perlis Jetty is the most popular choice among the visitors, as compared to Langkawi Island to Kuala Kedah and Langkawi Island to Penang. It takes about 1.25 hours Kuah on Langkawi to Kuala Perlis jetty by the high speed ferry. The ferry fare is RM 18.00 for adult and RM 13.00 for child. The first ferry departs from Kuah Langkawi Island at 7:30am morning and the last departure ferry is at 7:00pm evening. Online booking for ferry service from Langkawi Island to Kuala Perlis and Kuala Perlis to KL bus ticket is available. Alternatively, visitors can also buy ferry ticket over the counter for next ferry departure. The High speed ferry leaves Kuah on Langkawi Island for Kuala Perlis Jetty about 1.5 hour interval, depending on demand and the season. Therefore, visitors do not need to worry so much of long waiting time at Kuah on Langkawi Island. It is easy to book ticket online at BusOnlineTicket.com as long as you have internet connection and credit card or internet banking with you. 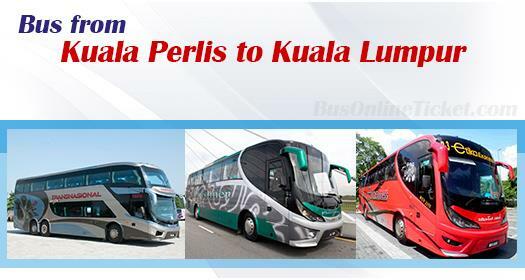 Advance features like seat selection and instant confirmation enhance the robustness of the online booking portal and provide great convenience to passengers booking Kuala Perlis to KL bus ticket.